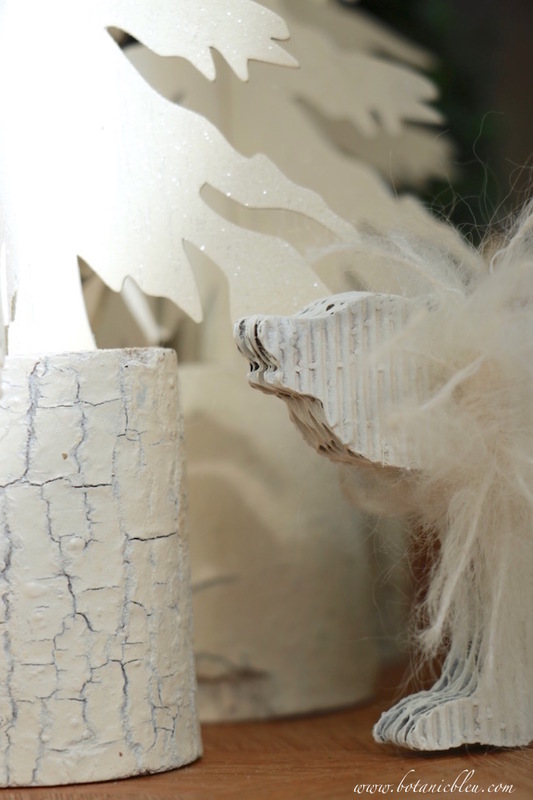 If you are a do-it-yourself person, your house is probably already stacked deep in glue, glitter, tinsel, ribbon, paint... Both my dining table and breakfast table are covered with Christmas projects (and have been for weeks), and it is not even Halloween. For most of my life, I was mortified that people began getting Christmas decorations together before Halloween, and I waited until after Thanksgiving to start my Christmas decorations. when Christmas decor started at my house. I started a Christmas pop up home business in my garden shed, and I started writing a blog. Both of these events require long range planning for holidays. Voilà! Just like that, I crossed over to the dark side, and Christmas projects took over my house, my budget, my thinking, my life... Which wasn't really all that hard to do since I have always loved Christmas. Add one more special event to this year's Christmas season, and the race to get all my special projects completed took on an even greater sense of urgency. The Annual Christmas Ornament Exchange is at my house this year. I love attending this special party every year, and really love when it is my turn to hostess. For over thirty years, a group of teachers who taught together at a local high school, most of us are retired now, have celebrated the Christmas season and our friendships by coming together for a Christmas potluck and ornament exchange. Each Christmas, we rotate who is the hostess. 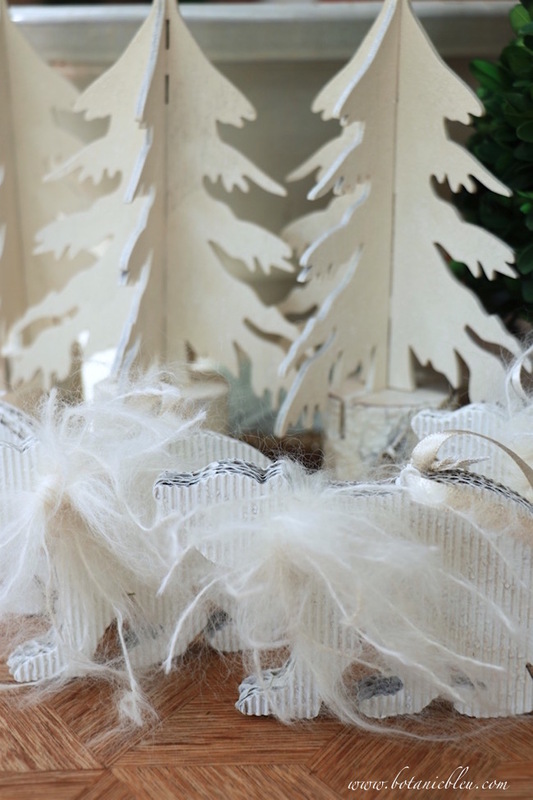 After seeing beautiful flocked Christmas trees filled with white ornaments last year, I started dreaming of a Christmas tree with snow and white ornaments for this year's party. Which means... lots of white ornaments. 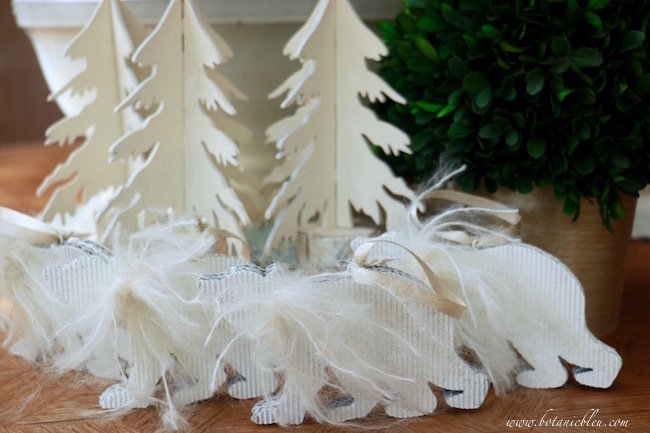 After making these easy adorable DIY polar bear white mohair ornaments, I thought you may want to make some for your Christmas decorations this year. 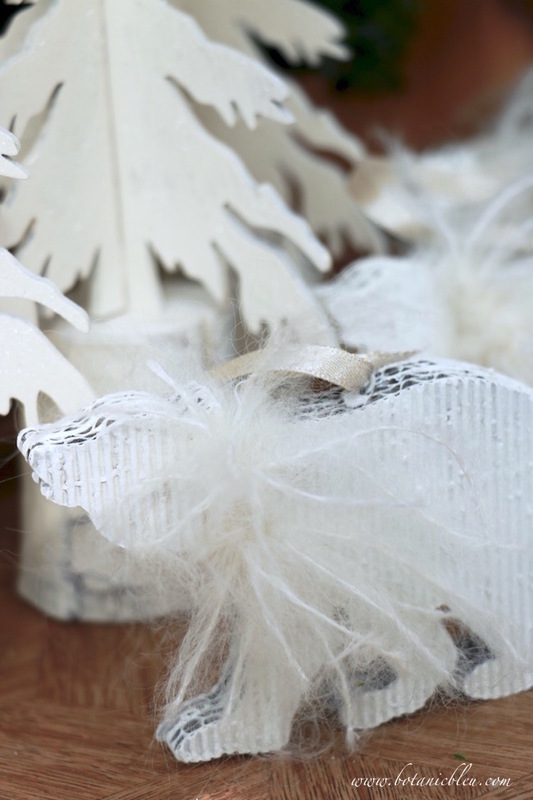 A tree ornament is just one of several ways you can use these in your Christmas decor. Add one tied to a special Christmas package instead of a bow. Use several to parade across your mantel. Place one with a small white Christmas tree on a bedside table in a guest room. Tie a gift tag with your guest's name either on the hanger or on the yarn around the bear's neck. Then your guest can take it home as a gift. Don't you love getting an unexpected hostess gift? One of these bears would be perfect for a hostess or for a teacher. Begin with a brown corrugated paper bear. These came from Hobby Lobby. If you cannot find these paper bears, look at your local craft stores for similar inexpensive paper or wood animals you can dress up with paint, yarn, and ribbon. 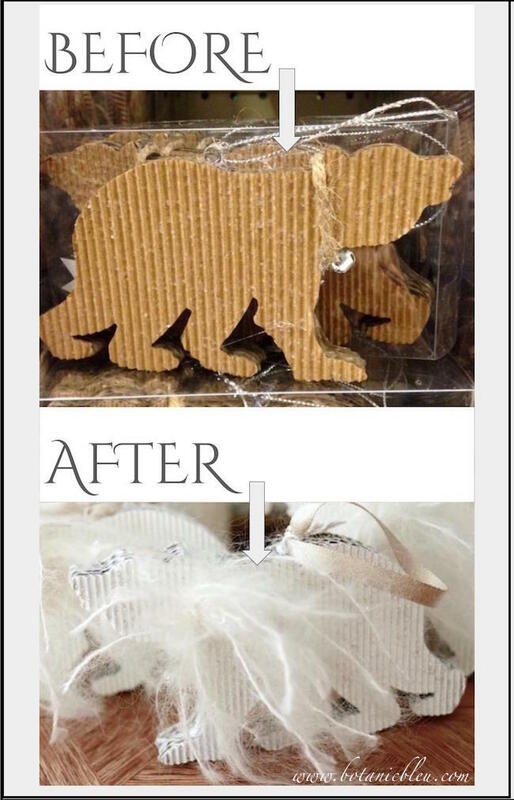 Seeing how these brown bears were transformed may inspire you to see beyond a simple ornament and recognize how beautiful it can become. 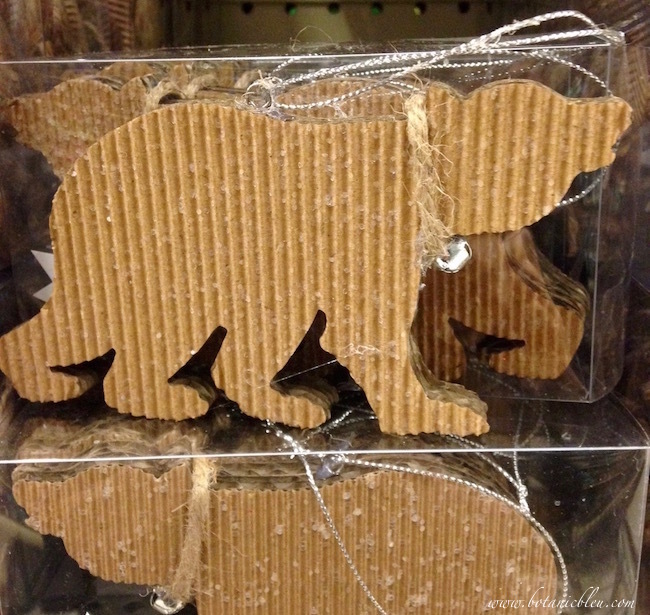 You can also cut out your own bear from a cardboard box. Draw a pattern on copier paper. Trace the pattern onto a cardboard box. Use an exacto knife to cut out your bears. The brown bears are cute, but can be made much cuter with a few changes. First, the silver bell was glued in place on the brown twine and is not an operating bell. That has to go! Cut off the brown twine and bell. Cut off the thin silver hanging cord. Spray paint the brown bears with white spray paint. Place the bears inside a big box outdoors to paint them. These bears had small nondescript flecks similar to glitter, but without the charm of glitter. Painted white they now resemble snow flecks. Make four to six large rounded loops of mohair yarn. The fuzzier the yarn, the better. My mohair yarn came from a specialty ribbon shop in Paris, France. I bought one ball each of white, rosy red, and navy blue mohair yarn to use in special decorating projects. That little touch of France makes every project extraordinaire! Make the loops long enough to tie around the bear's neck and hang down to the bear's feet. Tie the looped yarn around the bear's neck, and make a double knot, but not a bow. After tying the yarn around the bear's neck, cut the ends of the loops. Vary the cuts so you have some long, some short, some medium length strands of yarn to fluff. 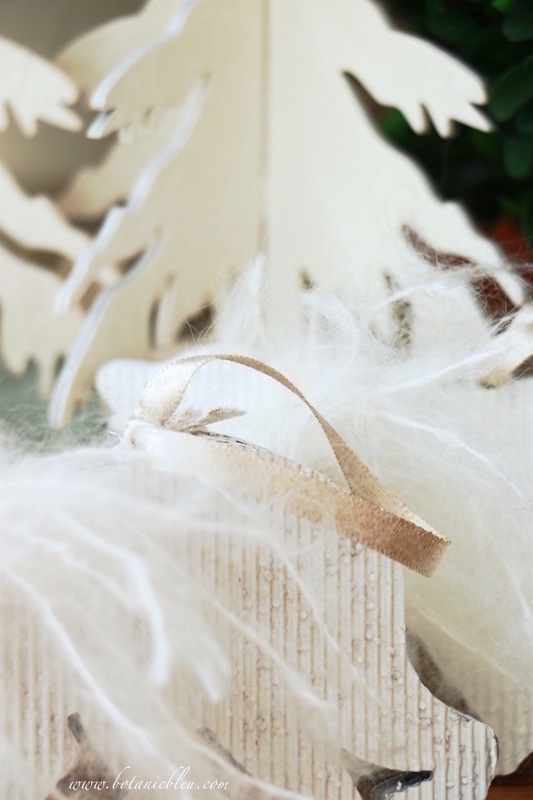 Tie a narrow gold ribbon to the eyelet as a hang tag for hanging the polar bear to a tree or for tying the bear to a gift package. Small inexpensive narrow ribbon dresses up ornaments so much nicer than the thin hanging cords that come on ornaments. Just replacing the thin cord with a nice ribbon makes ornaments extra special. You can see the different lengths of the mohair yarn in this photo. 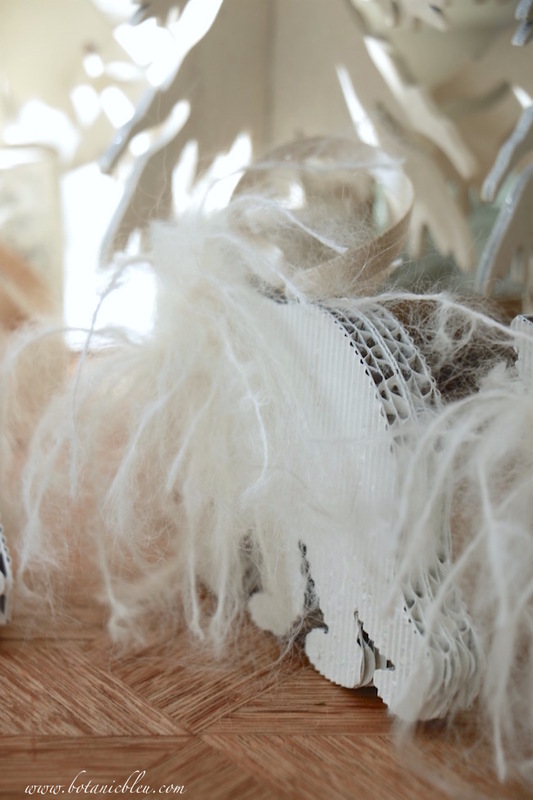 With a little spray paint, a fuzzy yarn, and a nice ribbon the little brown bear became a white mohair polar bear. After Thanksgiving, you can see my Christmas tree all decorated in time for the Annual Ornament Exchange Party. Not ready to decorate for Christmas? Pin a photo of the white mohair polar bear for reference later. 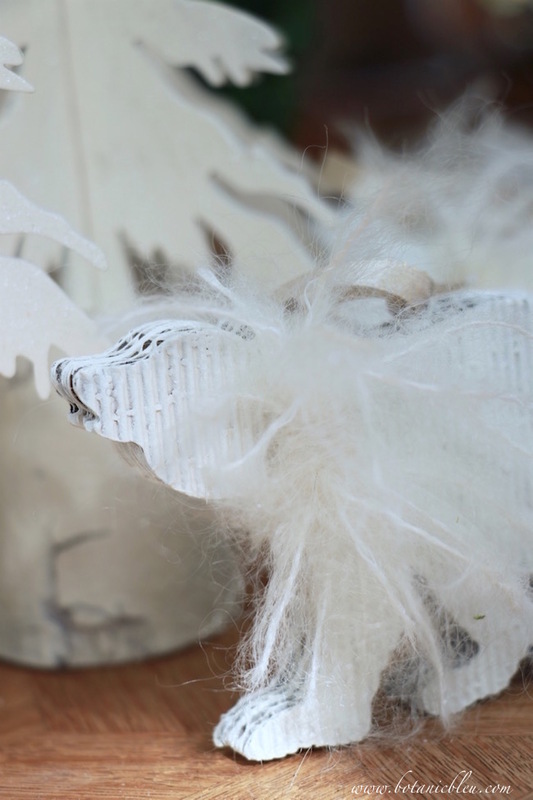 Have you started making or designing your Christmas decorations for this year? You may also enjoy reading the following. You are so creative! 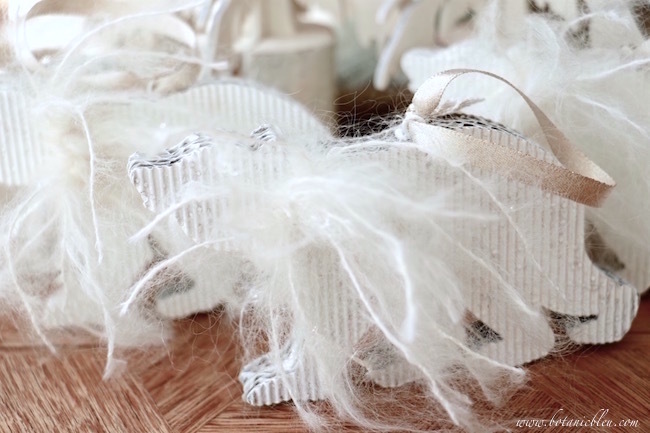 Love the soft effect of the white mohair on your bears. That is darling and so creative! So simple, but great impact! Pinning this for sure! You’re just so very creative! 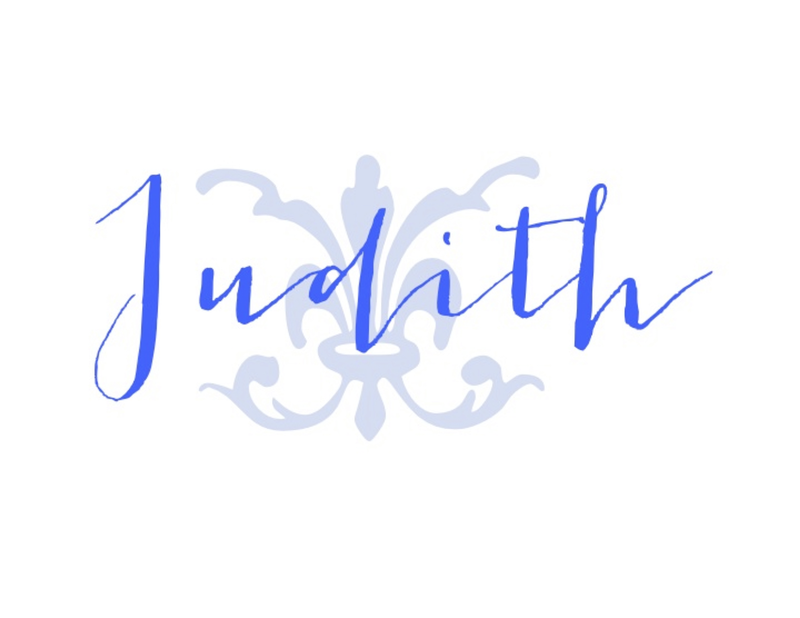 Oh Judith...........you have just made my day....maybe my entire year!!! When my Dad passed away, one of the things I found in the shop was a zip lock full of what he had labeled "Polar Bear Hair". I have NO idea if it is real, or something he found and dreamed up the label!